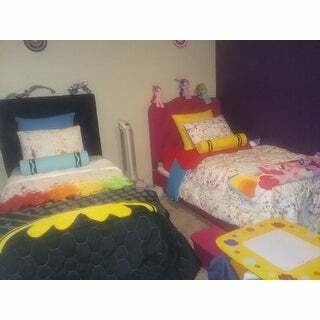 Give your child's bedroom a creative, bold touch with this comforter set. The plush fabric ensures soft comfort, and the set is machine washable for easy cleaning. 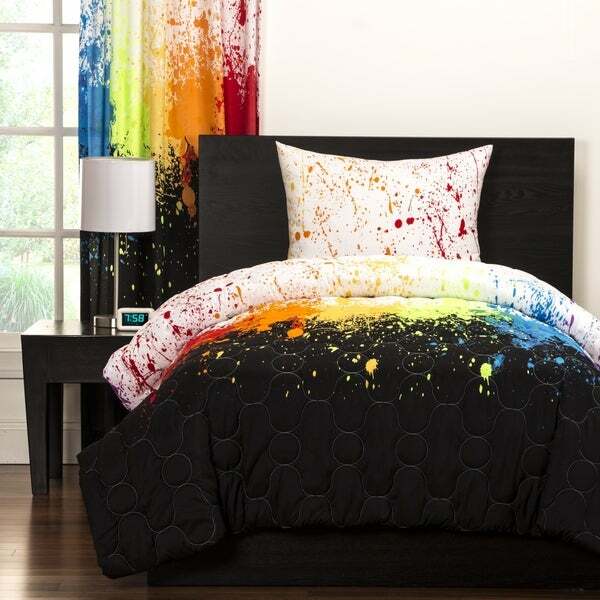 A multicolored, abstract splash design explodes across the black fabric, lending a colorful addition to your child's room. The set reverses to a white fabric with another vibrant, colorful design for a versatile look. 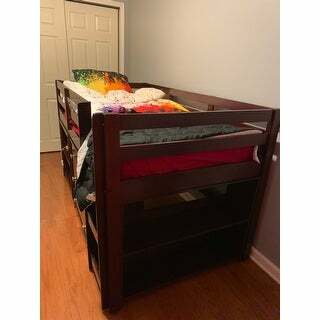 This set looks amazing in my grandsons bedroom along with the specially designed handmade black tufted headboard with multi colored buttons that I made for him. The comforter is indeed lightweight but very nice quality. The shams and draperies brings it all together for a fun, inviting, and and colorful bedroom scenery. He and sister can't stay out of there LOL! UPDATE: Several months after buying the comforter set the inside filling started pooping out through tiny holes in the fabric. Would I still buy it again, YES. I still like it! Love this set for my sons' room. 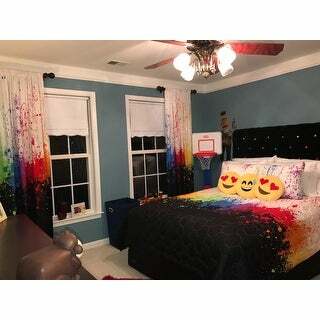 Their room is lego themed but this colorful comforter and matching window panels fits in perfectly. The comforter is not super thick but I like it on the thinner side so it can be used year round. We remodeled our daughters room and she absolutely loved this comforter! It looks great! I thought that the comforter would be mostly black but just the bottom is black...the majority is white. Also when I washed it for the first time the stuffing started pulling out from the comforter in tiny holes. :( Not too happy with it. 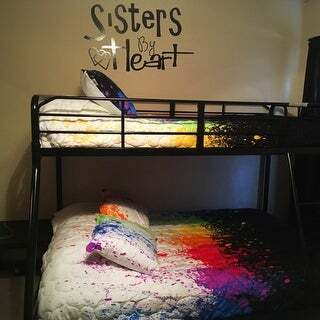 Super bright and fun for our soon to be 11yr old whose room has a black painted wall with paint splatters all over it so it matches perfect!! This comforter is thin and not warm so thats a bummer-be prepared to have layers of blankets under! Not worth the price, I paid *** after a 12% discount and the comforter is very thin and the pillow cases are different colors. My teenage daughter LOVES this set, and my son wants one like it. It is not as thick as I thought it would be, so during winter months a blanket will be needed. Overall, It is definitely a winner with the teenagers. Cute. Looks just like picture. My daughter loves it. Just as pictured - wish it were softer though. My 13 year old son wanted this set. Pricey to say it only comes with a blanket & 1 pillow case. But he loves it & it looks good with his black bed. Well made comforter. Matches the curtains too! Washes and drys good. No seams coming undone. It has held its color through all of the washes. It’s not very thick, so that may mean it you keep a cold house you may need a blanket under it. Overall, for the design and vibrant colors we are pleased with this purchase. Colors and size as represented online. Soft and cozy! My daughter loves it. Lightweight and colorful. Would recommend for any childs bedroom. The colors are awesome. Can use with so many different color accessories. I love the feeling of this comforter! It's cool and soft. Seems to be well made. No loose strings or anything of that matter. I wish that its came in king.. I had to get the queen set for my king bed. It works, but finding matching bright sheets that are affordable is merely impossible. 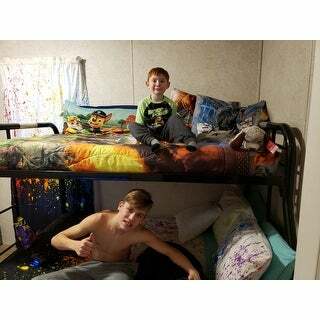 Awesome bed set!! "can I purchase the curtains?" 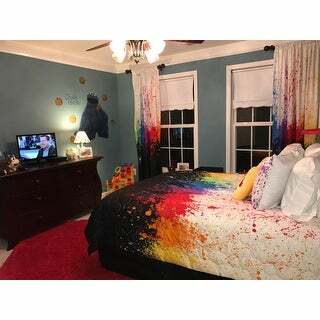 "Where can I buy the splatter sheets and pillow cases from? Thanks." We do not have them at this time. "Where can you purchase the sheet set at?" Unfortunately, the sheet set is not currently offered within our inventory. We apologize for any inconvience. "Are the shams reversible also? (white on one side, black on the other?)" Hello Cindy L., the shams are not reversible. The front is white with the paint splatter, and the back is just white. Thanks for shopping with us! "The description says the comforter is reversible. What color is the other side?" Hello tina155, the other side is white. Thanks for shopping with us! I love the color and hope it matches the color on the picture.